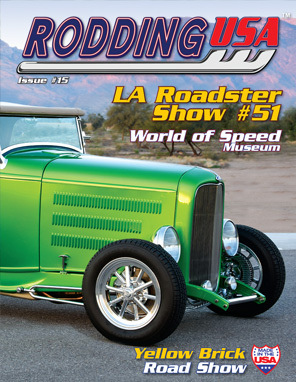 Rodding USA magazine's Issue #15 is in stock and available to order now. Magazines ship next day. Issue#15 features something stunning for everyone with six top features on traditional hot rods like Donald Perry’s deuce roadster and Bert Diehl’s 1927 Ford roadster. Our Special Interest articles include a tour of the new World of Speed Museum in Wilsonville, OR, a Garage Scene, the Greg Morris Collection in Hugoton, KS and a look inside Billy’s BBQ Restaurant in Liberal, KS. And while in Kansas Editor Paul Martinez attended the Yellow Brick Road Show plus we cover Super Bell’s 40thAnniversary Show in Peculiar, MO and hot off the press coverage of the 51st Los Angeles Roadster Show in Pomona, CA. All that plus our regular columns, showcases and our growing dealer network. Rodding USA, by hot rodders, for hot rodders.